Note: You can also check the step by step process that goes into detail on how you can set up App Relationships in Fusioo. Field on the connected App The name of the Field that will be added on the other side of the relationship. The filter is used to exclude records in relationships based on certain criterias. For example, let’s say you connect the Tasks and Projects Apps. 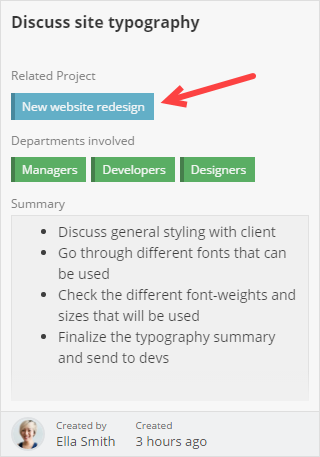 When adding a new Task and selecting a Related Project, you want to exclude Archived Projects from the list and only display Open Projects. Note: In the List View and Badge View, the Field set as Badge Heading is used to represent the record. Find out how you can configure the Badge and change the Field used as Badge Heading. When using an App Relationship Field, you will be able to create filters using Fields from the connected App. For example, if you expand the Related project Field, you will see all the Fields in the Projects App which you can use for filtering.